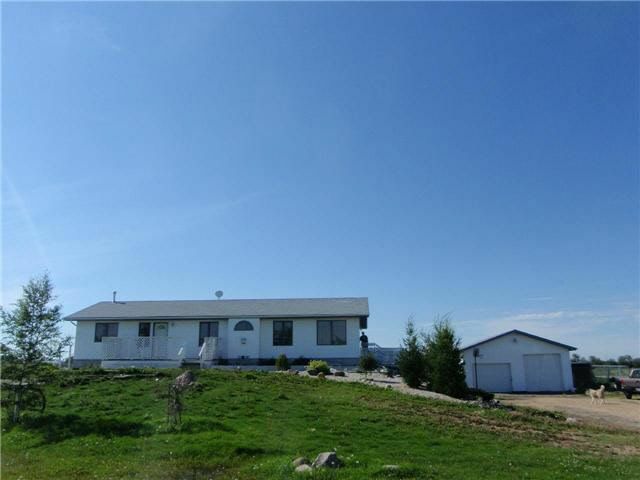 Just off city limit and hwy 21 beautiful bilevel is nestled on 17+ acres with a fully finished WALK OUT basement.this living room showcase a beautiful fireplace and richly toned hardwood flooring wall to wall window in sunroom which is a wonderful place to just relax and unwind. big country style kitchen, chef featuring oak cupboard and island.the formal dinning room will allow you to entertainment family Walk out basement door take You to farm area and beautiful landscaping, big deck upstairs and downstairs patio.2 sheds and a dog house are some of other other features in this house. The over sized 28 x 26 double detached garage is big enough to shelter your toys.This well kept house is MUST SEE !Property is close to Belvedere Golf and Country Club.